There’s a new café in Adelaide’s north and it’s producing more than great coffee and cakes. Flourish on Coventry Café is creating opportunities for people looking to get a leg up in the hospitality and food production industry. 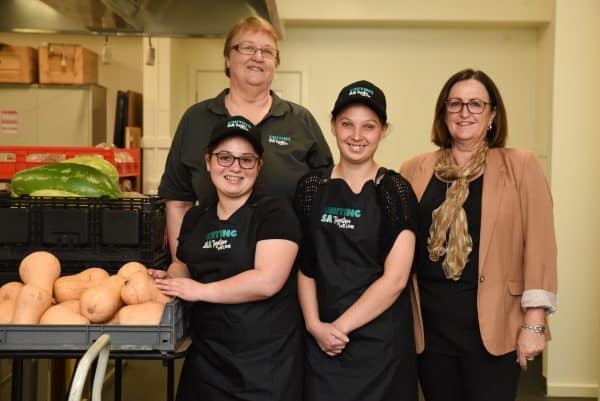 Run by UnitingSA as part of a partnership with the City of Playford, the café is a training ground for people wanting to learn cooking and customer service skills, while obtaining qualifications. Trainees visit the site in Smithfield Plains two days a week to undertake hands on learning in the kitchen and theory in a nearby classroom. UnitingSA Employment Services manager Cherie Jolly says it is providing people with a disability new skills to create opportunity and choice for their future pathways. “It’s about building skills in food production to give them a variety of options to move forward in open employment,” Cherie says. “It’s a real life training setting with support from a qualified chef who is the supervisor, plus we have disability expert support through Barkuma and UnitingSA will bring in our own support workers as well. Cheryl is one of the inaugural trainees and at age 23, she is excited by the new opportunity. “One of my favourite parts is food handling and learning new skills that I haven’t learnt before, like using the coffee machine,” she says. “I like talking to customers and working with the others here as well. Fellow trainee Chelsea, 20, pictured right, also says developing new skills is her favourite part of the experience. “It’s pretty cool,” she says. Café supervisor Jeanette Kranz feels fortunate to have joined UnitingSA to take on the role. “It’s nice to do something that I know is helping people and giving back,” she says. 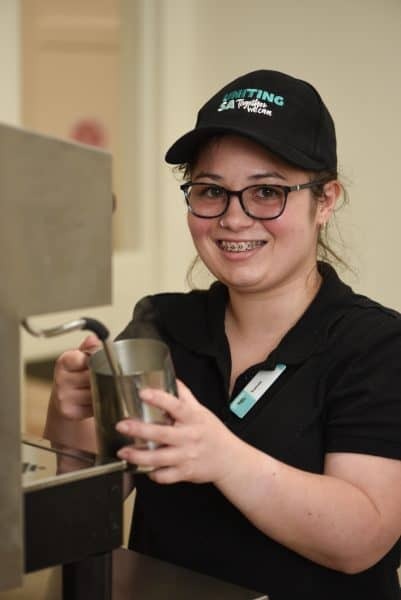 “I supervise, help them cook, and develop the skills they will need if they want to get employment in the hospitality field. The café is situated at The Precinct, a council-led project which includes a food cooperative – the Healthy Food Co. – and will soon launch a Men’s Shed, op-shop and more. Healthy Food Co. coordinator Kelly Clay says the whole concept aims to support people in the community, with an affordable place to buy healthy food and participate in activities. “We want to make it a community environment so people can come in and have the ability to shop, have a coffee, go to the op-shop,” she says. “At the Healthy Food Co. people can buy small portions so it is easier to budget. The initiative has been made possible thanks to funding through the Department for Industry and Skills (formerly the Department of State Development). Flourish on Coventry Café is open to the public at 112 Coventry Rd, Smithfield Plains, Monday to Friday, 9.30am-2.30pm.